Home » Esmeralda. Phoebus de Chateaupers. Notre Dame de Paris. 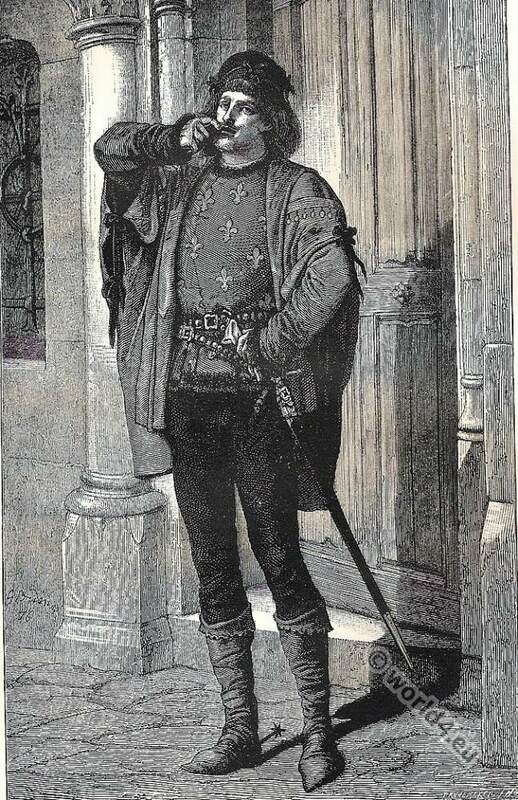 PHOEBUS DE CHATEAUPERS was a young man of aristocratic, though somewhat arrogant and swaggering, mien-one of those fine fellows about whom all women agree, although serious men and physiognomists shrug their shoulders at them. The youthful cavalier wore the brilliant uniform of a captain of the archers of the household troops. Hugo’s” Notre Dame de Paris.” G. Brion, Artist. Pannemaker, Engraver. 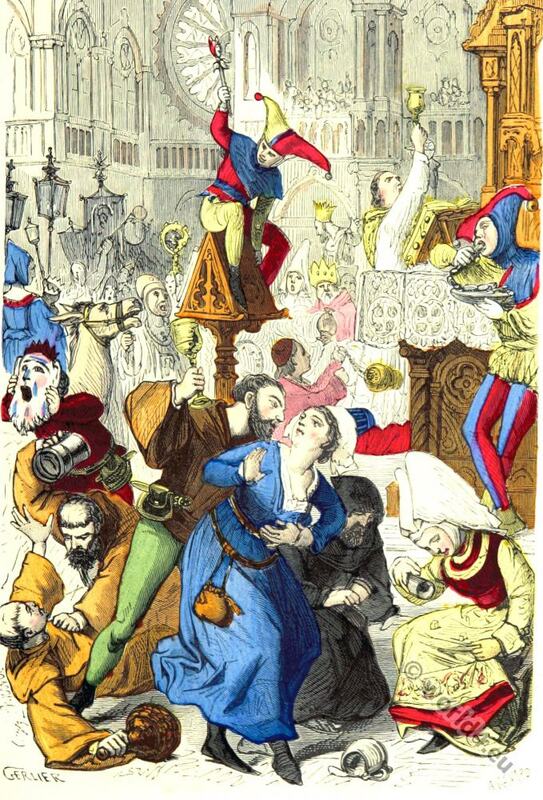 The Feast of Fools and dances of the Middle Ages. Notre-Dame de Paris is a 1831 published historical novel by French writer Victor Hugo (1802-1885). The beginning of the novel forms a crowd scene of medieval Paris: the double celebration of the Epiphany and the fools day on 6 January of the year 1482nd. 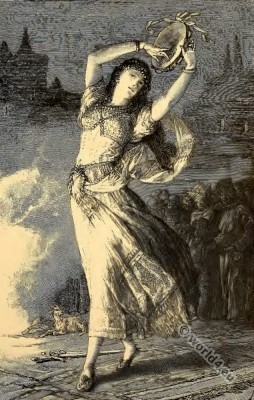 An important figure of the fool festival is Esmeralda, a gypsy girl who wins viewers through her dancing and attracts followers. Quasimodo wants to kidnap Esmeralda, but this stopped by a captain of the royal bodyguard named Phoebus. Quasimodo was a misshapen foundling raised by the provost of Notre-Dame, and adapted for Hunchback of Notre Dame. IN the vast space left free between the crowd and the fire, a young girl was dancing. “She was not tall, but seemed to be, so proudly erect did she hold her slender figure. She was brown, but it was evident that by daylight her skin must have that lovely golden gleam peculiar to Spanish and Roman beauties. Her tiny foot was Andalusian, too, for it fitted both snugly and easily into its dainty shoe. She danced, she turned, she twirled upon an antique Persian carpet thrown carelessly beneath her feet; and every time her radiant figure passed, as she turned, her great black eyes sent forth lightning flashes.